Sometimes simple is best. And this pork stir fry fits the bill. When you come home dead tired at the end of each day, you want something quick and easy, right? Chinese takeout is great, but learning how to make your own stir fry is better. Stir fry is almost always my quick and easy answer, especially when I have great fresh vegetables kicking around. In spring, that means asparagus. I eat lots and lots of asparagus from March to May, and never again. I will not willingly eat crappy asparagus from South America, which I am sure is fine if you happen to live there, but I don’t want my produce flown in. Rant over. 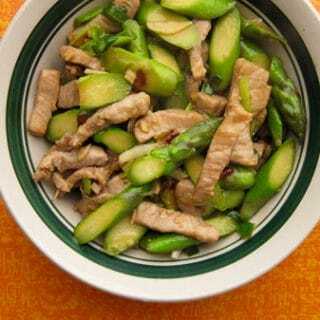 Anyway, this is a very basic pork stir fry you can adapt to whatever you happen to have on hand: Asparagus, green beans, snow peas, baby bok choy, sweet peppers, you name it. You could even make it vegetarian if you sub in some good mushrooms for the pork. If you happen to be using wild pork, you should know that wild pigs can be very tough, even when using the loin, as I did here. The teeth on this pig were ground down, so it was at least four years or so. That’s an old pig. And yeah, the backstrap was a little chewy. Not unpleasantly so, but a lot tougher than the flaccid pork you normally get at the Chinese takeout place. If this worries you, slice the loin into medallions and pound them between two pieces of plastic wrap. Then cut them into slivers for this recipe. You will not need to do this if you are using store-bought pork, as domestic pork is always less than a year old, and will be nice and tender. This lovely little dinner comes together fast, as all stir fries do, so have everything ready before you start, including the rice. It’s fresh, brightly flavored, savory — and best of all after a long day — easy. 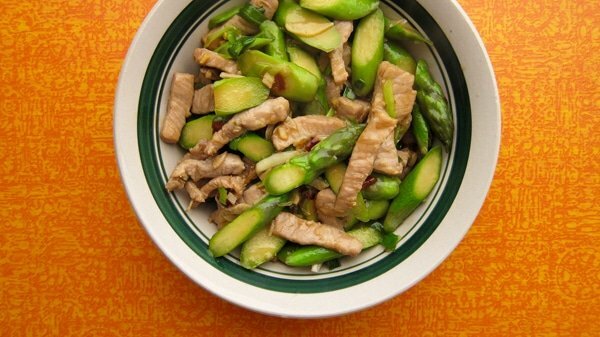 This is a really easy, very basic Chinese style stir fry. If you remember the basic method, you can stir fry any lean, boneless meat along with any seasonal vegetable. The marinade, the Chinese "trinity" of garlic, ginger and green onions and the sesame oil never change. If you don't like chiles, leave them out. Note this is not a "saucy" Chinese stir fry. If you want a saucier dish, double the marinade. 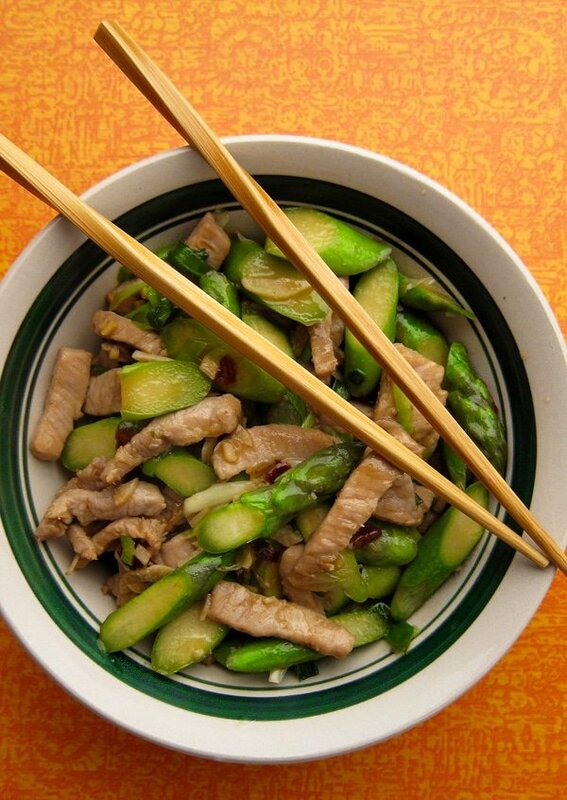 Slice the pork into slivers and mix it well with the marinade: The starch, soy sauce, Shaoxing wine, salt, sugar and sesame oil. Let this marinate on the counter while you cut all the vegetables, or abou 20 minutes or so. Heat a wok or large saute pan over high heat on your hottest burner for a minute or two. Add the peanut oil or lard and swirl it around. When it starts to smoke, add the minced garlic and ginger, as well as the crushed chiles. Stir fry this for 30 seconds. Add the pork and any marinade in the bowl and stir fry for 2 to 3 minutes, until the pork or wild pig turns opaque. Add the asparagus and green onions and stir fry 2 minutes, or until you begin to see some liquid start to form in the bottom of the wok. Don't cook for more than another 3 minutes or the pork will be overcooked. Turn off the heat and drizzle the sesame oil over everything. Serve with rice. You can find all sorts of recipes for pork, wild or store-bought, here on Hunter Angler Gardener Cook! Sometimes K.I.S.S. is the best way to do it, but I can’t wait to see all the cured meats you come up with. Looks and sounds great! I just happen to have some young wild boar, it is also the asparagus season here in Tuscany, so .. . .
Hank Shaw, the Great Hunter/Angler/Gardener/Cook had cold pizza? Picked my first asparagus of the year, and had some ramps to use-swapped those in for the green onions. Foraged for the pork at the grocery store, but it still was delicious and I didn’t need to pound the pork tenderloin. Nicely seasoned with the ginger and sesame oil. Served over brown basmati rice. Very tasty!